So, what other places in the solar system, besides Mars and the Moon, would it be possible to put a human settlement? Well, as it turns out, this is a pretty big question. 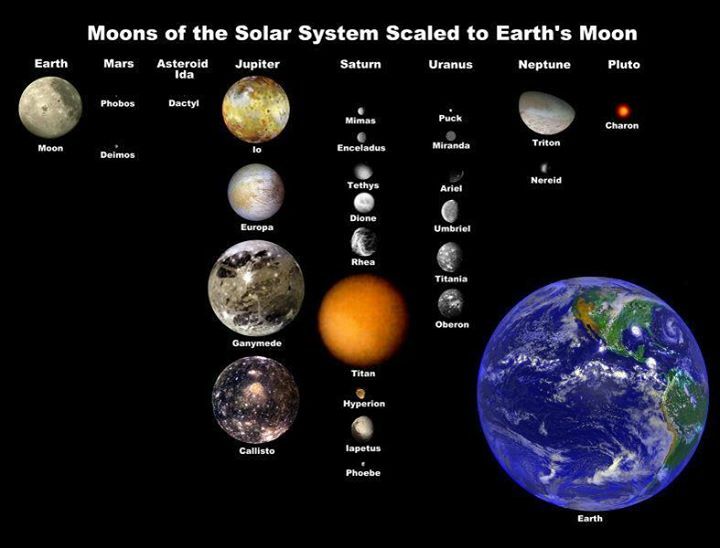 From where we are sitting, the solar system might seem like a pretty small place. However, there’s an amazing amount of objects that make up our little corner of the universe. Of course, there are the 8 planets. Then there are the 5 known dwarf planets. And there are some 146 natural satellites (moons) in our solar system. On top of all of this, there is the Kupier Belt and the Oort Cloud. Together, these two regions of the solar system could contain more than a trillion objects… Yes, a trillion objects. It is nearly impossible to make a comprehensive list of all the potentially habitable bodies in the solar system. And even if I were to make such a list, it would be ridiculously long and you wouldn’t want to read it. Consequently, we will just do a brief overview of the objects that we could live on without stretching the theoretical limits too far. Mars, (or even teraforming the red planet) and Earth’s Moon, of course, are both viable options. So are Mars’ moons, Phobos and Deimos. These satellites are both small, rocky bodies. However, they are *very* small. Tiny, in fact. Phobos, for example, is only 6 miles (10km) wide. But a tiny, habitable world is, after all, still habitable. The rest of the planets, Jupiter, Saturn, Uranus, and Neptune, are all out. These are the gas giants of the solar system; saying that they are not conducive to life is a bit like saying the plague is not conducive to life. However, some of their moons hold some promise. Looking at Jupiter’s 4 largest moons is promising…and also slightly terrifying. Io is the most volcanically active object in the solar system (so that’s a no-go). However, some scientists have suggested that it might be possible to live beneath the icy outer layer of Europa. Ganymede and Callisto are two more icy worlds; these could possibly sustain human life if we built subsurface colonies. However, Jupiter has intense radiation belts. This intense environment would make living in the Jovian system rather risky…if not entirely deadly. Callisto is really the only large satellite that is far enough from the radiation belts to sustain human habitation. Moving out towards Saturn we reach Titan (one of the best candidates for habitability in the outer solar system). With an average temperature of about -289 degrees Fahrenheit (-178 degrees Celsius), Titan is rather chilly, however, the temperatures are not so extreme that they make habitability impossible. Enceladus is another satellite that could possibly sustain a human colony. Again, terribly cold, but not so cold that the moon is entirely ruled out. When we reach Uranus, we find a number of cold bodies that are potentially habitable: Miranda, Ariel, Umbriel, Titania, and Oberon. All of these bodies are amazingly far away, so establishing colonies there would cost an astronomical amount of money and take a very long time. Some have argued that Neptune’s Triton is another (cold) possibility. The last two groupings (Uranus and Neptune) are really pushing the theoretical possibilities. Some of these worlds have lakes of liquid methane, extremely toxic atmospheres, and a slew of other hurdles that we would need to overcome. However, if we had adequate funding, we would probably develop the technology needed to make colonies on these icy worlds. As a final point, we can’t even get a bio-dome to work on Earth. So I seriously question our ability to establish a permanent colony. But, if we were going to embark on such an endeavor, the best candidates are the Moon, Mars, Phobos, Deimos, Callisto, Titan, and Enceladus (not necessiarly in that order). Phew! And that’s it for now. Of course, I am leaving out the Kuiper Belt, Oort Cloud, and nearly all of the small satellites in the solar system. But, as I said, a comprehensive list would be very, very long (and probably boring).